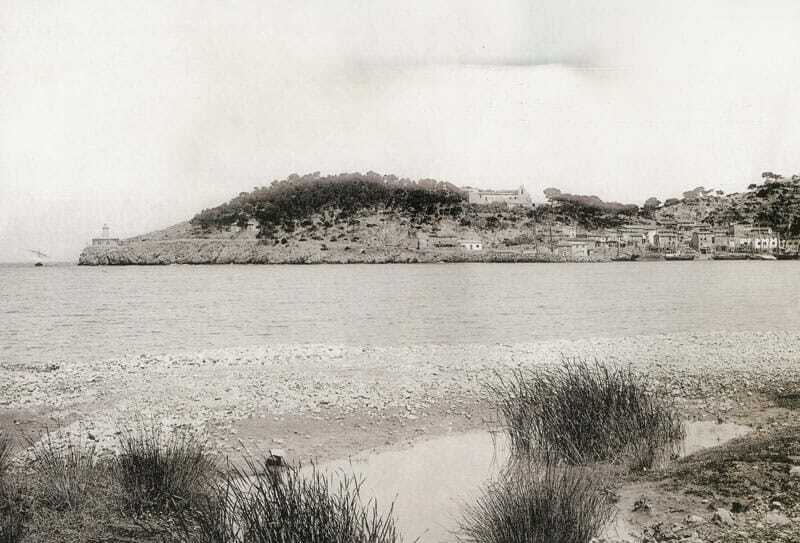 “… the difficulty to find a suitable place to sleep, soon caused us grief, and we realised that the Spanish people who had praised Mallorca as hospitable and provided with all needs, had not only betrayed themselves, but also us. In the neighbourhood of the big civilization, we would not have expected, that there would not be one single guesthouse around…” (George Sand in ‘A winter in Mallorca’). Mallorca’s first settlers, who came to the island from the South of France between the 6th and 5th century/millennium B.C. even had to put up with caves. Between this first and the second ‘French Connection’ when Jaume I conquered the island in 1229, there were two more considerable island occupancies: around 123 BC the Romans arrived and in 903 the Moors. The Romans introduced wheat and vines. Furthermore, they planted the first olive trees on the sunny island in the middle of a fertile valley, which was surrounded by high mountains and opened like a shell towards the Mediterranean Sea. Thanks to aquifers, which they also implemented, the harvests fundamentally nourished the wealth of the respective owners over centuries. The moors expanded the irrigation systems, created olive plantations and extracted the golden oil from the fruits of the trees. In their architecturally thought through heavenly gardens they planted decorative orange trees, which exuded enthralling, pleasant smells and of which the tree barks were used as a medicine. Similar to the Spanish mainland, economy, art, culture and free practice of science, medicine and religion blossomed under the Moorish power and free practice, but that’s a different story. Nevertheless, their history and end in Mallorca could begin as follows: once upon a time there was a rich, gloriously pretty island in the Mediterranean on which the Moors…. In any case, the wealth and favourable location created considerable envy. In addition the pirate raids of the Arabs living there interfered/disturbed the own capital crimes and trade of the bordering countries. For the young king Jaume I of Aragón, who reigned over Aragón, Montpellier, Perpignan, Roussillion and Provence, this was reason enough to ‘free’ the Mallorcan people, in Catholic mission of course, from the Moors and the tolerant Arabic high culture in 1229. At the same time he re-established/continued/revived the French Connection: He split the island between his liegemen from the South of France and Catalonia, after most of the Moors had been driven out, enslaved or murdered. (Some could return to their land later as a tenant, as the new owners depended on their skills and technical know-how). All of them spoke Catalan, a language, which had developed in the contemporary Northwest of Spain and the contemporary South of France. It is closely related to the Okkzitanic, the medieval French, which was spoken in the South of France and which is similar to the Medieval Latin and modern Italian. The close connection can easily be heard in words such as ‘bona nit’ or ‘bon nuit’, in ‘poma’ and ‘pommes’, in ‘demà’ und ‘demains’. Part II of the French Connection started with the conquest of Mallorca by Jaume I and is today fundamental for the self understanding of many Mallorcans, which see / distinguish their history with the start of the Catalan conquest. Evil tongues even claim that the Mallorcan calendar only starts with the arrival of Jaume I. The third and in the closest sense French connection, comes from the French revolution in 1789. When France was threatening to drown in the turmoil of the rebellion, not only aristocrats fled the country to other European countries or the new world to escape the guillotine, but members of all social levels. Therefore, French farmers, wine growers, cloth workers and traders set out for the big, wide world: Some came to Sóller. This third French “conquer / conquest” brought new wealth to the small town in the wind-protected sunny valley. The revolution refugees planted orange groves with sweet Oranges, which had been brought to Europe from Southeast Asia by the Portuguese. From the port of Sóller they organised the shipment of the oranges to the southern French towns of Sète, Marseille, Montpellier and Cannes. There the sun fruit was sold by relatives and friends in small fruit shops with names like ‘Jardins d’Espagne’: This marked the beginning of the blooming trade of citrus and tropical fruit, which was organised as a cooperative and ran between Mallorca, the Spanish mainland, France and even as far as Germany. However, this blooming trade and orange-connection was not going to be heaven forever. A plague of insects destroyed the big plantations in the sixties of the 19th century. Inhabitants, who had just been rich, turned destitute. A partly reversed refugee wave started. They went north. Many Sollerics were looking for work in France. Others even dared to travel much further: to Cuba, Venezuela and Puerto Rico. 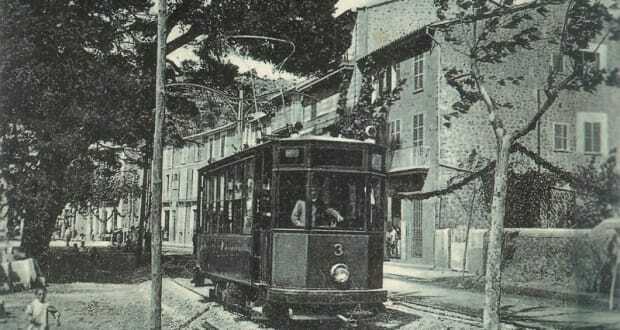 Many of those emigrants later proudly returned to Sóller. The influence and cosmopolitan attitudes especially of those who had looked beyond the mountain-framed valley, were not only limited to trade. The homecomers from the Caribbean built town palaces in the colonial neo baroque style or neo classicism, with pillars, portals and gables, which heralded the regained wealth. Those returning from France brought the Art Nouveau, the so-called ‘Modernismo’ in Spain, to Palma and Sóller. The orange cultivation and export also bloomed again in the meantime. At the beginning of the 20th century the high vitamin C content, with its value for health was discovered. Those who remained home and had regained wealth perfected the local building style. Now, they built themselves ample and elegant houses with Marès stone facades and lavish wrought iron balconies and entrances. 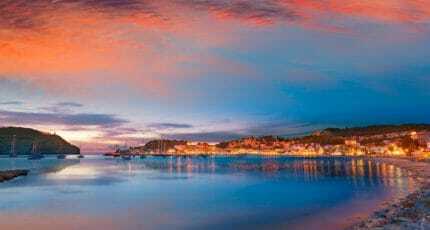 Despite the turbulent times in Mallorca, the island remained, for most Europeans until the 1920s, ‘terra incognita’. Only a few insiders, intellectuals and individualists were drawn to the sun-spoilt island by its scenic beauty and climate. 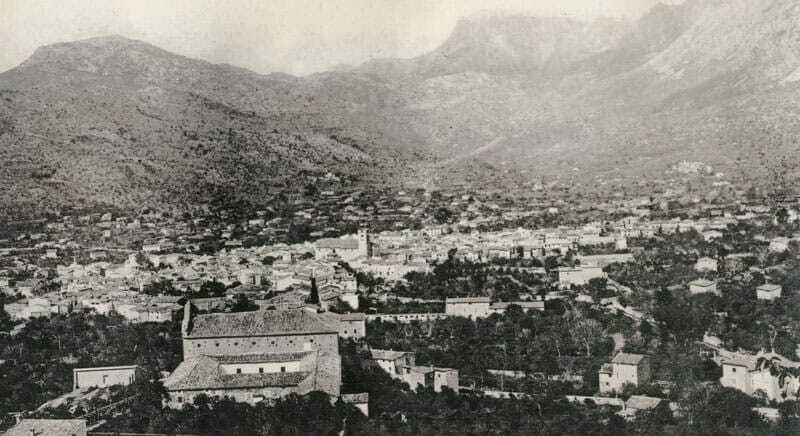 Even after the publication of Georges Sand’s book ‘A winter in Mallorca‘ in 1842 the island remained, to a large degree, unknown, just as after the publication of a 9-volume work about the Balearics by the Austrian archduke Salvator between 1869 and 1891. Madame Amantine Aurore Lucie Dupin, as George Sand was called by her parents, came to the island too early. 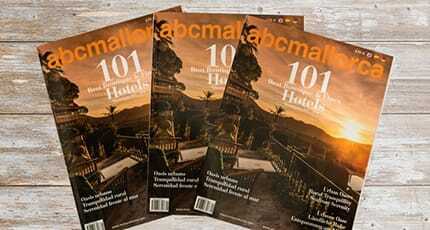 It was only in the 1920’s and 1930’s that the first tourists arrived in significant numbers in Mallorca. 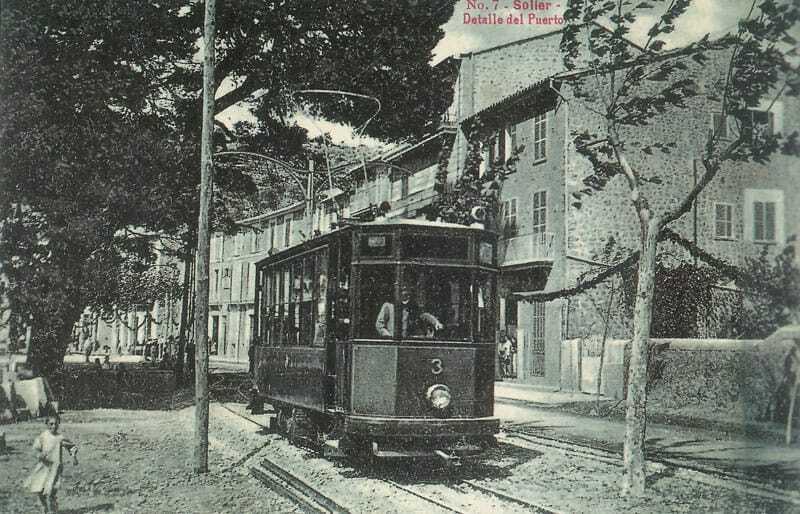 Many hotels were built in Pollenca and Port de Sóller, which could be reached by tram from Sóller. At this time the first holiday urbanisations were built, among others the first French urbanisation was in Portals Nous, which was built on raised terrain with marvellous sea views. 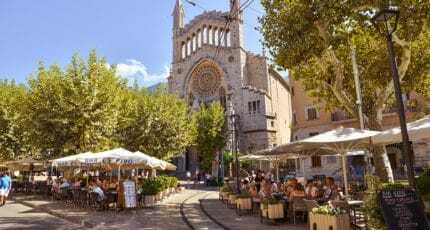 However, mostly British people live there today, while the majority of French visitors are still attracted to Sóller and the nearby villages of Fornalutx and Biniaraix or Pollenca. Today George Sand couldn’t complain about a lack of hotels and certainly not about a lack of hospitality: Next to a French School and the Alliance Francaise, a culture institute in the Calle San Feliu, in Palma where among other things French classes are offered there is also enough ‘savoir vivre’, which Chopin and Sand missed so badly. After the German and English residents, the French residents are number three among the Europeans, with around 5,000 registered residents on the Balearics. The importance of the close maritime trade relation with France, the Spanish mainland and overseas is now duly documented: The first Museo Maritím in Mallorca was opened on August 24th 2004 in Port de Sóller. Plus the island’s ex-council president Antònia Munar opened a new chapter of the French connection: together with her national-liberal Unió Mallorquina she wants to officially declare George Sand as Mallorca’s adoptive / step-daughter. For more information about the area of Sóller see: All about Sóller. 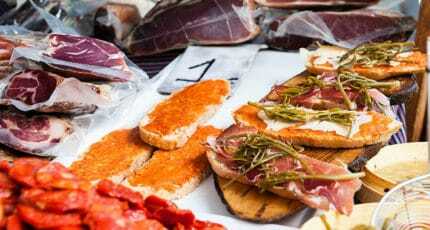 We hope you have found this article about the Mallorca’s French Connections useful and that you have many memorable stays in Mallorca as a result of our recommendations.